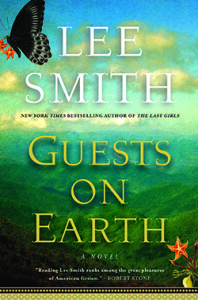 I just finished Lee Smith’s 2014 novel, Guests on Earth, and I am in awe of her. What a masterpiece! Just a few weeks ago I did a post about her memoir, Dimestore: A Writer’s Life, which was also amazing. When I learned that her son had schizophrenia and took his own life, I wanted to read Guests on Earth, which is set mostly at Highland Hospital in Asheville, North Carolina, where Smith’s son was treated in the 1980s, and where her father was a patient in the 1950s. But the most prominent patient was Zelda Fitzgerald, wife of F. Scott Fitzgerald. Her beauty and brilliance are shown throughout the novel, as her talents in dance and painting and writing are revealed, along with some complexities surrounding her marriage. The title comes from a letter Scott Fitzgerald wrote to his daughter, Scottie, in 1940: ‘The insane are always mere guests on earth, eternal strangers carrying around broken decalogues that they cannot read.’ This novel intends to examine the very thing line between sanity and insanity. Who’s ‘crazy’ and who’s not? What does that even mean? I’m especially interested in women and madness—and in the resonance between art and madness. I also want to show that very real lives are lived within these illnesses. And she succeeds in Guests on Earth, a novel of historic, scientific, and artistic importance. I recommend it for anyone whose life has been touched by mental illness, but also anyone who loves good literature. Yes, Nina! I hope you also love it!